As Rova enters its 35th season, the Berlin-based recording company Jazzwerkstatt is now releasing a new, quartet-only CD of original works by band members. Recorded in February, 2003 and August, 2011, the disc includes the long-awaited release of the Larry Ochs composition Certain Space, along with recent works by Steve Adams and Jon Raskin. A Short History defines 3 key regions of Rova's musical domain. With The Blocks, Adams continues his fascination with the interplay of chiseled, harmonically dense rhythmic figuration, providing the quartet with a wealth of material to blow thickets of sound and build on the composition's DNA. To the Right of the Blue Wall is Jon Raskin's conceptual vehicle for open field improvisation, which relies heavily on Rova's creative application of its evolving vocabulary, and the layering of compositional elements with the quartet's proprietary memes. Ochs' Certain Space flows from the composer's propensity for epic narratives. The piece unfolds into a succession of 3 settings, each dedicated to, and inspired by, the influential composers Giacinto Scelsi, Cecil Taylor and Morton Feldman. Inventively performed, exquisitely recorded, and handsomely packaged, this latest release is a milestone in Rova's recorded archive - further evidence that the quartet's 4th decade has been it most artistically rewarding. 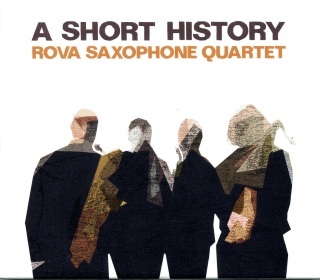 ROVA SAXOPHONE QUARTET [BRUCE ACKLEY/STEVE ADAMS/LARRY OCHS/JON RASKIN] - A Short History (Jazzwerkstatt; Germany) Bruce Ackley on soprano & tenor sax, Steve Adams on alto & sopranino sax, Larry Ochs on tenor & sopranino sax and Jon Raskin on baritone & alto sax. The Rova Sax Quartet have been around for more than three decades and they have had only 1 personnel change since they started. Hence, their music has evolved much over a long time and they remain completely focused and at the top of their game. For this disc, Rova plays only material written by three of its members. This is a studio recording and the sounds is splendid, warm and well-balanced throughout. Steve Adams' "The Blocks" consists of a series of solos which are backed by some kaleidoscopic harmonies and counterpoint by the other members of the quartet. Jon Raskin's "To the Right of the Blue Wall" starts out quietly with all four saxes playing breath-like sounds and then fragments are slowly assembled from there. Much of this is melodic and contemplative so patience is required to appreciate their more subtle side which grows in density as it moves along. The last and longest part of this disc in Larry Ochs' "Introduction" in four parts. Each of the three numbered sections are dedicated to composers or musicians: Giacinto Scelsi, Cecil Taylor and Morton Feldman. This piece is superb as it deals with some advanced and well constructed ideas. It is a constantly shifting series of layered lines. As the front sax or soloist plays, the other saxes move in different waves. Since the tempo is slow, we can hear the way each shift grows and changes. The writing here or sound of the sax quartet reminds me of the way a great string quartet piece explores similar ideas. When the Cecil Taylor dedication begins, the piece shifts into a more intense, abrupt series of spiraling parts. Not unlike the way Mr. Taylor can knock you right out of your seat when he unleashes those near-violent waves. The section moves between more minimal fragments and more explosive parts, showing the extremes that we all have to deal with day in and out. The Morton Feldman dedication of course deals with some extremely subtle breath-like sounds and quaint harmonies. Again, Mr. Ochs seems to being drawing some inspiration from his esteemed dedicatee.